Microsoft took the wraps off of Windows Phone 7 Series (the official name for Windows Mobile 7) here Monday at Mobile World Congress. Slated to launch on handsets by holiday season 2010, Windows Phone 7 Series is a complete overhaul from previous versions of the OS. If you're familiar with the Zune HD's user interface, you'll feel right at home with Windows 7. Microsoft hinted that the Zune and Windows Mobile teams were working closely and you can definitely see this relationship in Series 7. The menus and interface have the same fluid animations and clean typeface as the Zune HD's. The Quick Launch screen is a far-cry from the old Windows Mobile start screen. Large, colorful tiles serve as shortcuts to your most-used or favorite apps or Web sites. 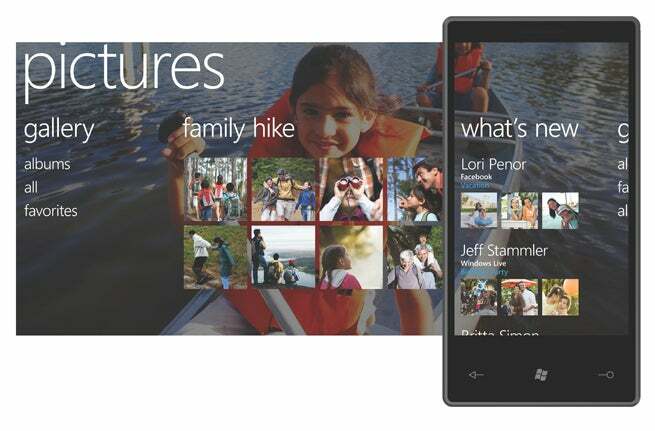 You can also place live tiles on the screen with links to your Facebook profile or friends. These tiles are live, meaning if the content of the app or site is updated, the tile will update on your screen. So if you have a link to a friend's Facebook profile on your Quick Launch screen, that tile will update when they change their picture. It is a bit creepy if you don't know them very well, but cool nonetheless. With a tap and drag, you can easily move them around in any order you like or press a broken heart icon to remove them from the screen. Swiping right takes you to a list of all of your apps. If you want to move one of your apps to your Quick Launch display, you simply press down on the app and select "add to quick launch." When you're in an app, you'll see a row of other menu options at the top of the display. Like the Zune, you can "pan" through these menu items with a flick of your finger. If you want to go back to the previous menu, you simply hit the arrow key at the top of the interface. The People Hub aggregates you friends from all of your social networks in three screens: Recent, All, What's New. Recent will show you friends who have just updated their profiles or statuses while All will show you all of your friends. What's new quickly aggregates status updates all into a single feed. You can also quickly share your own status update. The Pictures Hub lets you see all of the pictures on your hub, your most recent pictures and what's new with all of your friends. The phone will pick the latest pictures you uploaded or have taken with your phone. And, like the People Hub, What's New in pictures shows your friend's most recent picture uploads. The Pictures Hub allows you to easily share your own photos with your social networks. 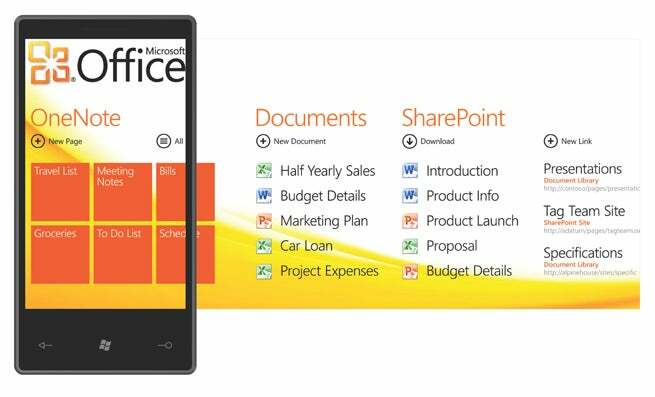 The Office Hub lets you easily sync your documents between your phone and your PC. Office Hub comes with OneNote, for notetaking, Documents, and Sharepoint for presentation collaboration. Users will also have access to an Outlook Mail application which gives similar features, like flagging important e-mail, that you'd find on the desktop version. Despite the rumors leading up to the conference, there was no "Zune Phone" announcement, but all Windows 7 phones will ship with the same music and video features as the Zune HD. Users will also be able to manage their music with the Zune PC software. Does this mean the death of the standalone Zune HD player? If you're an Xbox owner and want to keep tabs on your friends' achievements, Windows 7 phones will come with a mobile version of Xbox Xbox LIVE games, Spotlight feed and the ability to see a gamer's avatar, Achievements and gamer profile. Users will also be able to purchase games and apps easily from the Windows Marketplace as well. Windows 7 phones will also ship with Bing Maps, which has some unique features that are on par with Google Maps. Bing Maps dynamically update with street-view photos, 3D graphics and directions. It also shows you real-time traffic updates and reviews of local businesses via Yelp. According to Microsoft, hardware partners will not be able to replace the Windows 7 UI. 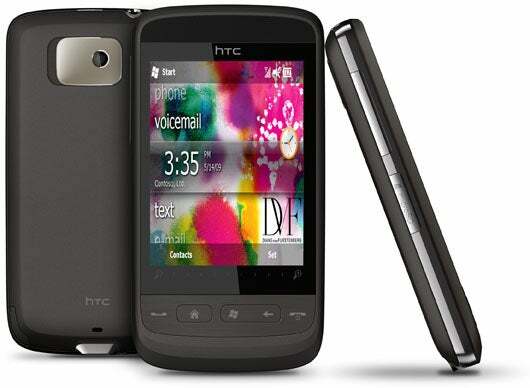 So if you're a fan of HTC's TouchFLO user interface, which runs over older versions of HTC Windows Mobile phones, you're out of luck. It is a bit surprising that Microsoft has locked in the Windows 7 interface because one draw of the platform was the number of different flavors you could get it in. Microsoft is also taking further control over the hardware side. All Windows Series 7 phones will ship with three hardware buttons: Home, Search, and Back. They'll also all be capacitive touch-enabled with multitouch. Microsoft's hardware partners include Dell, HTC, Garmin ASUS, LG, Samsung, SE, Toshiba, HP and Qualcomm. NVIDIA, which provided the Tegra chip in the Zune HD hardware, is noticeably absent. Microsoft had no comment. Microsoft plans on bringing Windows 7 phones to all four major U.S. carriers, but are working with AT&T and Orange more closely to bring full lines of Windows 7 phones to the carriers. 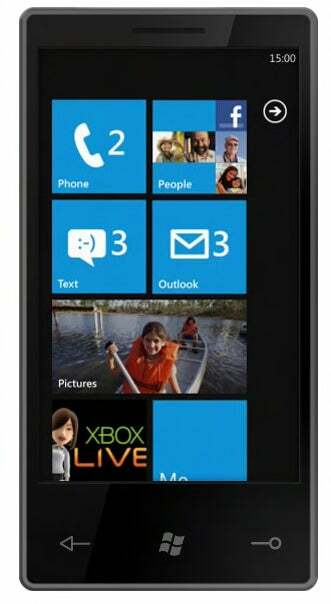 Microsoft plans to have Windows phones in the market by the end of this year for the 2010 holiday season.